I love Agatha Christie. I love her novels, I love her plays and I love her life story. I love Poirot, Marple and even Tommy and Tuppence. Passenger to Frankfurt, however? This I did not love. 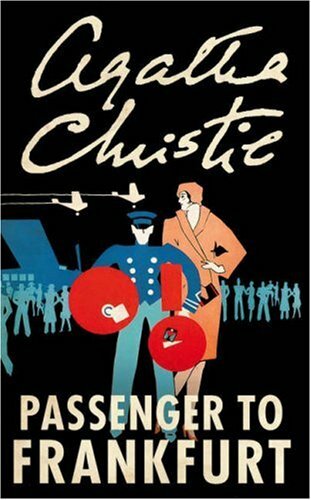 The last Christie book I read was The Body in the Library– you can find my review here, just to prove that I’m usually a fan! A middle-aged diplomat is accosted in an airport lounge and his identity stolen. Sir Stafford Nye’s journey home from Malaya to London takes an unexpected twist in the passnger loungs at Frankfurt — a young woman confides in him that someone is trying to kill her. Yet their paths are to cross again and again — and each time the mystery woman is introduced as a different person. Equally at home in any guise in any society she draws Sir Stafford into a game of political intrigue more dangerous than he could possibly imagine. In an arena where no-one can be sure of anyone, Nye must do battle with a well-armed, well-financed, well-trained — and invisible — enemy! It just doesn’t read like an Agatha Christie mystery novel at all – there’s no crime to solve and no suspects to investigate. It has much more of a political vibe. A moderately successful diplomat, Stafford Nye, is recruited by a mysterious committee to discover who is causing the youth of the world to revolt. He flies all over the world with his companion in order to… umm, have a lot of conversations with people. There’s not a whole lot of action – just pages and pages of dialogue. By the end there were so many new characters I was seriously considering making a list to keep them all straight in my head. The plot changes direction from page to page, so the ending really only makes any sense at all if you’ve been paying very close attention – which I hadn’t. The best thing about this book was Ms. Christie’s introduction at the beginning. She was such a wonderfully witty woman, and her own musings are always a pleasure to read. She talks about how irritating she finds journalists who perpetually ask her from where she gets her ideas, and how she yearns to tell them that she plucks them off the shelves at Woolworths. It pains me to write such a negative review of an Agatha Christie book – until this point I’ve pretty much loved them all. I’m excusing it by pointing out again that this isn’t a murder mystery novel at all – more a story of political intrigue. I want to read a Christie book sometime but maybe I'll stay away from this one! Seeing as I'm still kind of on the fence when it comes to dear Agatha, I'm not really sure I'm going to be hunting this down. I think the version of 'And Then There Were None' that I read also had an introduction from Christie's biography, which I liked. It did make me like her a lot more, which makes me want to read her books more! OOH speaking of ATTWN (as I am dubbing it), stay well away from the 1945(ish) film adaptation! It was really cool and atmospheric in a black-and-white-film kind of way and then the ending is COMPLETELY changed so that it isn't even clever anymore! It was worse because I'd totally bigged it up to Boyfriend only to have him look at me at the end as though I was stupid…I can't even explain my indignation without ruining it for other people! I shall email you sometime soon and explain why it's so rubbish. Bet you can't wait!! Sorry, I rambled off topic there! In short: I probably won't read this and that is a good thing because it might spoil the tentative love I have for Ms Christie! Phewf! @LIB – They changed they ending? What!? But the entire point of ATTWN is the ending! That's what makes it so clever. Definitely e-mail me – I'm dying to know what they changed it to. It's like when they changed the ending of My Sister's Keeper. Why do they DO THIS!? Honestly, I was so mad – there was much pointing at the screen and ranting! I've emailed you on its general hideousness so that you know how truly awful it is. What makes it worse is that I even read a few reviews of the film that were all good! Obviously not written by people who had read the book! @vanillahearts62 – My favourite Christie novel is 100% definitely And Then There Were None. There's a great review of it here. I whole heartily agree about Passenger to Frankfort. I am a huge fan of AC. Fans should just stay away.